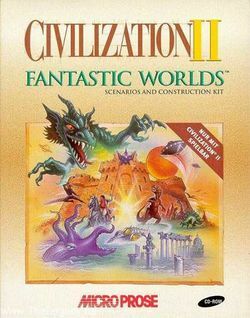 Civilization II: Fantastic Worlds is an expansion for Civilization II, released by MicroProse in 1997. The game adds new scenarios that have many unique settings, such as one scenario dealing with colonization of Mars, one scenario called Midgard that has Elven, Goblin, Merman, and other civilizations from fantasy. There are also some scenarios based on other MicroProse games such as X-Com and Master of Orion scenarios. Fantastic Worlds also created a whole new scenario editor that allows you to change units, city improvements, terrain, technology trees, place in triggers, and vastly enhance the game. This page was last edited on 17 June 2013, at 05:04.